For many of us, The Lord of the Rings trilogy was just an introduction to how beautiful New Zealand is. The trilogies of The Lord of the Rings and The Hobbit were filmed entirely in New Zealand, which was made possible by the country’s diverse landscape and natural wonders. There was no better place to bring J.R.R Tolkien’s books to life! It’s quite clear as soon as you start travelling outside of Auckland city, that New Zealand is “real Middle Earth”. As you travel through the Waikato region surrounded by rolling green hills, you could quite easily believe you are passing through The Shire. Then, within three hours’ drive of The Shire you can be in Mordor, also known as the Tongariro National Park. See, Frodo, it wasn’t that hard. Although the majority of New Zealand could be plucked straight from a Lord of the Rings movie – excluding our awesome beaches, we don’t remember seeing Gandalf sunbathing on an Abel Tasman beach – we know that diehard fans must see the exact Lord of the Rings filming locations. So, here are the most famous Lord of the Rings filming locations you have to see when backpacking through New Zealand. Near the quaint little town of Matamata just happens to be the quaint little town of Hobbiton. Matamata is surrounded by lush green farmland and rolling hills – a landscape that The Lord of the Rings director and New Zealander, Peter Jackson, thought would be the perfect location for the town of Hobbiton. This is where all Middle Earth adventures begin! The movie set was built for The Lord of the Rings then revamped for The Hobbit. The small town is brought to life with Hobbit-holes, the Party Tree, Bag End and the Green Dragon tavern. 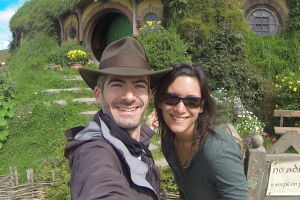 You can see it all by taking a tour around the movie set, gathering tons of photos with Hobbit-holes and getting some insider stories from your tour guide. To top it off, the tour ends with a drink at the Green Dragon. As you approach the centre of the North Island, you can’t help but notice the three volcanoes looming in the distance! The perfectly cone-shaped volcano is none other than Mt Doom, or as the locals call it, Mt Ngauruhoe. 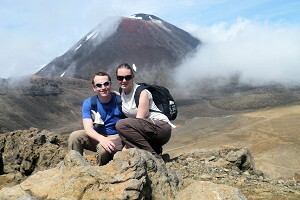 It is possible to hike all the way to the summit of Mt Doom, as a side trip to the hugely popular Tongariro Crossing. The Tongariro Crossing is a one-day hike showcasing some of the best volcanic scenery in New Zealand, with the Emerald Lake and Red Crater. It is a must for any backpacker travelling New Zealand! Mt Ruapehu is another volcano used to depict Mordor in The Lord of the Rings. On the Whakapapa side of Mt Ruapehu, walk to Meads Wall to see where Frodo and Sam approached the Black Gates of Mordor. On the Turoa side, the Mangawhero River was where Gollum hunts for fish. This Lord of the Rings filming location is missed out all too often by backpackers travelling in the North Island. However, the Putangirua Pinnacles truly deserve to be on any Middle Earth fan’s bucket list! The Putangirua Pinnacles are towering weathered pillars found in the very south of the North Island. From first sight, it is instantly clear that they were used for the setting of Dimholt Road in The Return of the King, where Aragorn, Legolas and Gimli search for the Army of the Undead. The pinnacles are a two-three hours’ return hike from the Pinnacles campsite near Cape Palliser. Do you remember the extensive battle scenes in The Return of the King? Of course you do! It was all filmed here in the stunning tussock-covered fields of Twizel. This part of New Zealand has seen a lot: the battle of Pelennor Fields, the death of King Theoden, Eowyn killing the Nazgul and the Witch King, and more. Twizel is one of The Lord of the Rings locations in New Zealand where you can take a tour to the exact filming locations and even dress up in the appropriate costumes and props! Admittedly, this is a Hobbit location rather than The Lord of the Rings. Nonetheless, the crystal clear waters of this river gorge are a must-see for any movie fan. The river was used for the famous barrel scene in The Desolation of Smaug, where Bilbo and the dwarves float in barrels down Forest River to escape the elves and orcs. 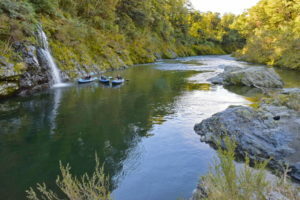 Not only is the Pelorus River a stunning filming location, but it is a great spot for freedom kayaking or going on a specialised Hobbit kayaking tour. See the behind-the-scenes magic of The Lord of the Rings and The Hobbit. The Weta Workshop it where the costumes, props and visual effects were created for, not only The Lord of the Rings and The Hobbit, but a whole host of blockbuster movies. The Weta Cave is a small shop and museum with figurines, costumes and props to view and purchase. You can also watch a short video about what Weta does. For a small fee, take the Weta Workshop tour to learn about how the movies were made and even get your hands on some Middle Earth weapons. Above are just some of the amazing Middle Earth locations you can visit while on your gap year in New Zealand. With more than 150 locations used during the filming of The Lord of the Rings, you are really spoiled for choice. Check out our Lord of the Rings Bucket List to help plan your Middle Earth adventure in New Zealand.